Seamus the collie cross is back reviewing Pure's Turkey Terrific Super Sensitive Recipe, priced at £32.99. Rerro to my readers, it's Raymus here. It's been a while since I've featured on this blog - a whole year in fact. 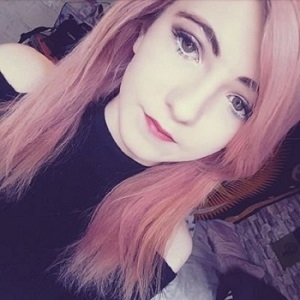 I had a bit of a scare involving the C word in late 2016, so I've been raycuperating since then and focusing on my general health. Bad news first, is that I couldn't go to Carding Mill Valley for my birthday a few weeks ago, I was so looking forward to it, but I got an upset stomach from some food I'd been eating, and my peoples didn't want me leaving them a gift on the platform or the train. Without getting too personal, and frankly too gross, some food really sets off my stomach. Brands like Pedigree, Bakers and Wagg were my life when I was a pups, but as I've matured I've gone off them as they don't agree with me anymore. I think it's the 'grain' in a lot of brands. 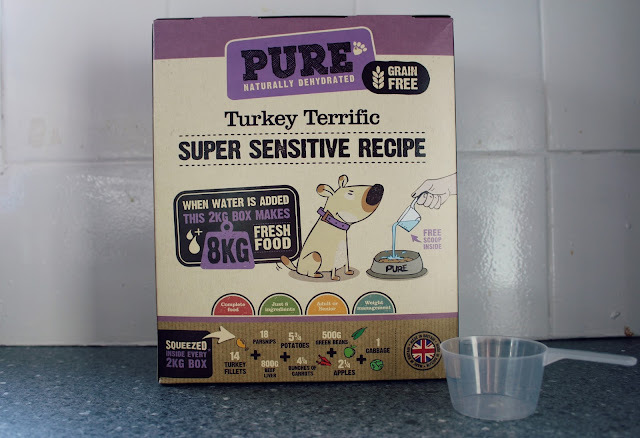 Good news though is that I'm back with a review today, and it's all about a dog food brand that I do get on with called 'PURE' and I just wanted to bark a bit about it to you guys. It smelled almost like oatmeal, but it's packed with veg and turkey goodness, the quality of the ingredients definitely gave me something worth howling about. My peoples have been brand hopping with grain free and holistic blend foods for a while, with some making me constipated and some making me puke, and whilst one other dog food brand, Harrington's, sits with me well, I'm a fussy pooch and I need me some flavour in my diet. I normally wolf down my food, but I've been taking it slow with this dish, minding my manners and wanting to savour every bite. The Turkey Terrific Dish contains ingredients like beef liver, turkey, green beans, cabbage, apple, carrots - all the good stuff and the company are very transparent with what they put into the dish. Anecdote time: For my third birthday, I had a beef liver cake, it was pawsome and has been one of my favourite foods since. The food comes in a sand-like texture, it's naturally dehydrated and then packaged up in their food facility in Yorkshire - meaning they can cram more into a box. The food lasted me just over a week, which is good considering I'm a relatively large pooch. If you had a smaller pupper, you're looking at 3-4 weeks per box - for larger than life doggos, like great danes and huskies, it'll last about five days. All you have to do is rehydrate it with warm water! I'm going to pass you over to Beth now, so she can talk about the only downside of the dish (in my eyes there is no downside). Would you feed your best friend something you wouldn't eat yourself? The only downside to Pure Pet Food is the cost. This box costs £32.99, which works out as £3.75 a day to feed my collie cross, but there's been a new flair to him recently, one that I can only put down to him having had this food. He's more energetic, he's playful again, just this afternoon he was trying to get me to chase him around the garden, which is a gleeful behaviour I haven't seen from him in a while to be honest. When I rationalise the price for a day's meal, it seems more than worth it, considering the food actually has human grade certification - meaning he'd be eating quality stuff. Now that I think about it, other dog food brands are incredibly cheap - about 60p per meal - it's no wonder he's been having issues. I'd be lying if I said this wasn't a difficult decision to make, it is, I'm not made of money, but to see him bright-eyed, looking well and happy means a lot to me. I guess the old saying "You get what you pay for." rings true for the dog food industry as well, and I've had enough of seeing him bloated and miserable and constantly eating grass to stop himself feeling sick from the other food he's had. I think what I'll do is mix the Turkey Terrific with his Harrington's half & half to keep the costs down a bit. I'll update this post in a month - sorry, Seamus will, and he'll let you know how he's getting on. If you want to try your pooch with Pure Pet Food, their starter packs are currently on offer at 40% off, with prices starting at £13.79. Seamus would definitely recommend it for fussy eaters, senior dogs and those with food sensitivities. You can also read other pooches success stories here too. Such an interesting post on the sense of it being in a Dogs perspective! Sounds like a great doggy product!